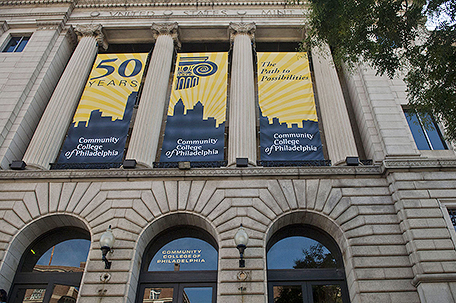 All Philadelphia high school students graduating in 2015 may be able to pursue an associate’s degree at Community College of Philadelphia with no cost for tuition and fees. Students need only submit the Free Application for Federal Student Aid (FAFSA), an application of federal and state financial aid, at www.fafsa.ed.gov. If they meet the eligibility requirements, the College will cover all remaining tuition and fees for up to three years (excluding summers) or until the completion of an associate’s degree, whichever comes first. The projected costs for the scholarships are about $200,000 in the first year; $300,000 the second year; and, $350,000 in year three, according to Gregory Murphy, the executive director of the Community College of Philadelphia Foundation. Contributions to the 50th Anniversary Scholarship Fund are being accepted, and donations have been received from staff, faculty, and stakeholders, Murphy said. In the long-term, the Foundation Board has committed to plan and support the College’s efforts to raise a $10 million endowment to sustain the scholarships. Once the high school graduates determine they are Pell Grant eligible, the College provides “last dollars” for tuition and fees unmet by federal or state grants. The next step students must take to receive the award is to complete the College’s online scholarship application at www.ccp.edu/scholarships. Only students who are U.S. Citizens or permanent residents who reside in Philadelphia and have graduated from a Philadelphia high school within the Philadelphia city limits are eligible to apply for the 50th Anniversary Scholars Program.